Promotional piece for Thanhouser release in England. 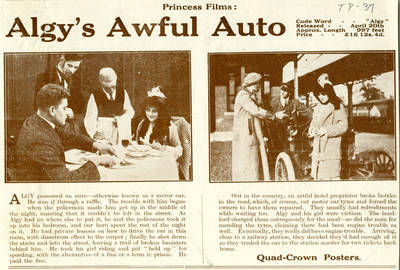 A Princess film directed by Carl Louis Gregory, who was also the cameraman, based on a scenario by Lloyd Lonergan. Starred Muriel Ostriche and possibly Cyril Chadwick, featured in other Algy comedies. Released October 31, 1913. Offset prints; 5" x 7.5"